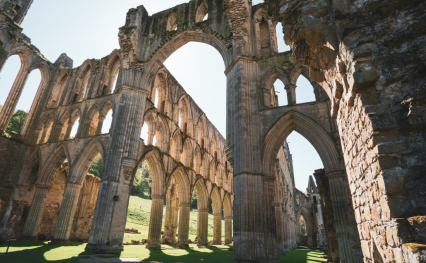 With stunning moorland, fabulous views, ancient castles, characterful coastline and fishing villages tucked into coves, the Cleveland Way National Trail offers a true taste of the North York Moors. Explore the Cleveland Way for three days, a week or even longer. 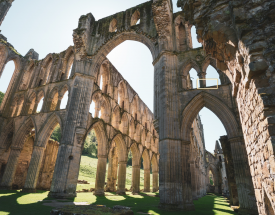 Find inspiration for your walking adventure using our suggested itineraries, or select one of our bookable itineraries which are highlighted with a star. 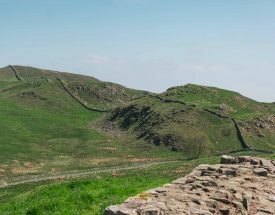 Find useful facts and learn more about the Cleveland Way below. Select the blue tabs below for more details. 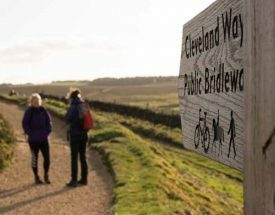 The Cleveland Way National Trail is a 109 mile (175 km) walking route through beautiful and ever-changing landscapes and scenery. Officially opened on 24th May 1969, it was the second recognised National Trail in England and Wales. 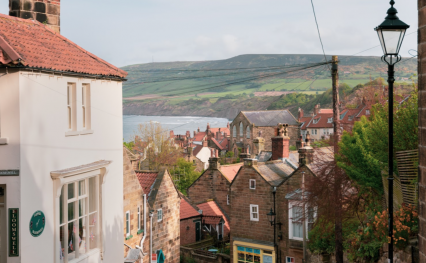 Starting from the attractive market town of Helmsley, the Cleveland Way heads across the inspirational, and breathtaking heather moorland of the North York Moors National Park, before reaching the coast at Saltburn-by-the-Sea. From here it’s a visual feast along the North Yorkshire coastline to Filey, passing old fishing villages and lively coastal towns. 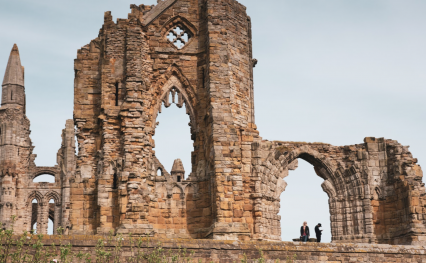 The National Trail runs through the famous smuggler’s village of Robin Hood’s Bay and the popular seaside resorts of Scarborough and Whitby – one of England’s best coastal towns and home to Whitby Abbey, the inspiration for Bram Stoker’s Dracula. Anyone who is reasonably fit can walk the Cleveland Way. The route is challenging in places, especially on the Cleveland Hills and some of the coastal sections, but this adds to the overall experience. Whilst the route is well-signed throughout, an up-to-date map or GPS mapping is essential. You can walk the Cleveland Way at any time of year but if you want to see the moorland heather in bloom, the best time to visit is late August and early September. Most people walk the route in a clockwise direction from Helmsley to Filey as you are likely to have the wind behind you. But there is no right or wrong way and plenty of people enjoy walking the route in the opposite direction. 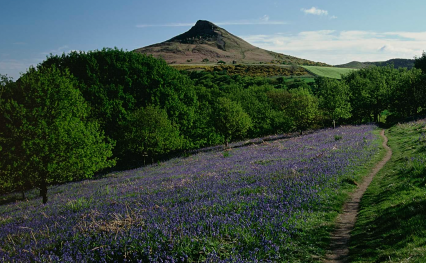 The Cleveland Way follows a horseshoe direction, encompassing great variety around much of the beautiful North York Moors National Park. 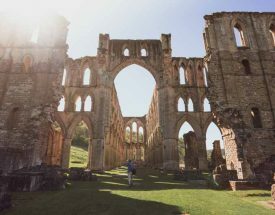 Running from the historic market town of Helmsley, across the North York Moors and along the dramatic North Yorkshire coastline to Filey, the Trail is considered a classic route because of the rich and varied landscape through which it passes. 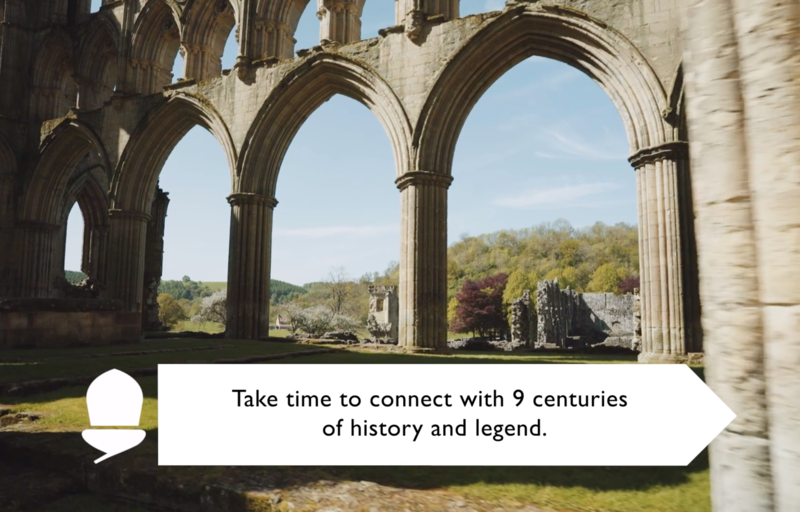 There is a wealth of history and heritage to enjoy along the way including Helmsley Castle, Rievaulx Abbey, the White Horse of Kilburn, Mount Grace Priory House and Gardens, Gisborough Priory, Whitby Abbey and Scarborough Castle. The Cleveland Way can be reached by ferry from Amsterdam to Newcastle or Rotterdam/Zeebrugge to Hull. If arriving at Hull, catch a bus from King George Dock to the Paragon Interchange where you can pick up train, bus and coach services. 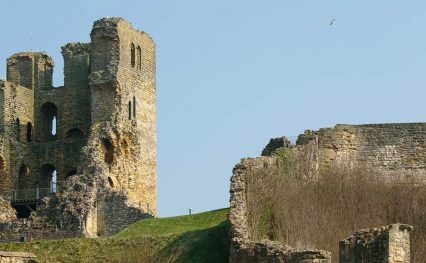 You could catch a train to Scarborough and then take the 128 bus from Scarborough, or a train to York and bus on to Helmsley to join the Trail. 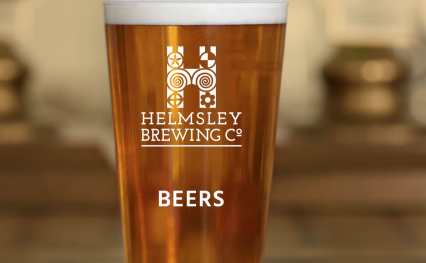 Alternatively, catch the train to York and a bus to Helmsley. 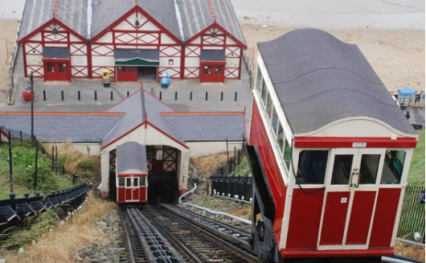 On finishing the Trail, you can catch either a bus or train directly from Filey back to Hull. 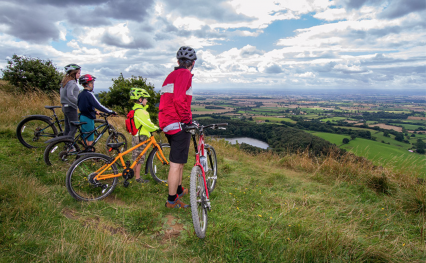 If arriving in Newcastle, catch a direct train to Darlington, Northallerton or York, where you can connect to Whitby or Scarborough, which are both on the Cleveland Way. The nearest airports to the Cleveland Way are Leeds Bradford, Manchester, Newcastle and Durham Tees Valley. Trains operate direct from Manchester Airport to York, Malton and Scarborough near the Cleveland Way. There are car parks located at numerous points along the Trail. If you want to leave your car in a public place whilst spending several days walking on the Cleveland Way, we recommend that you inform the local police of your intentions. You may be able to leave your car with your accommodation provider. Reaching the Cleveland Way by public transport is easy. There are various bus services running to the start of the Trail at Helmsley from York, Malton or Scarborough. Regular rail services connect to places along or near the Cleveland Way, including York, Malton, Thirsk, Middlesbrough, Great Ayton, Whitby, Scarborough and Filey. This National Trail passes through the very best landscapes – places you may want to explore for several days at a time. From cosy country inns to characterful cottages, we’ve got your accommodation near the Cleveland Way covered. You can find accommodation along the trail by using our interactive map.